Evil Brain from Outer Space (1965) - Sci-fi-central.com. Japan / USA  1965  78m   Directed by: Koreyoshi Akasaka, Teruo Ishii, Akira Mitsuwa.  Starring: Ken Utsui, Junko Ikeuchi, Minoru Takada, Makoto Abe, Hiroshi Asami, Kami Ashita, Chisako Hara, Hiroshi Hayashi, Terumi Hoshi, Noriko Katsuma, Shûji Kawabe, Den Kunikata, Shinsuke Mikimoto.  Music by: Michiaki Watanabe. This movie is a compilation/compression of the last three one hour features of the "Sūpā Jaiantsu" (Supergiant) series. 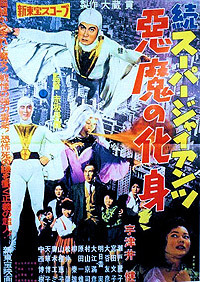 "Starman" for us or "Spaceman" for European audiences, was Japan's first film superhero and lead the way to future stars such as Ultraman and several animated heroes my own children enjoyed. I highly recommend these movies for people able to look at them with objectiveness and respect for the time-frame they were produced 1957~59. They are also inoffensive for children for parents caring about their youngster's innocent minds. Despite some "ugly" if not "goofy" monsters by today's standards, there is no gratuitous violence or gory scenes and the fight scenes are "gentle" if not dance-like. Special effects match what was available with similar resources like "The Outer Limits" of the mid sixties. Dubbing is average for a production that old which was post-synch in the US It is also difficult to dub Japanese with English language because of the marked difference in phonetics (sound generation by mouth motion). The original music was replaced with dubbing studio file soundtrack in the US. One has to be cautious criticizing older features especially of foreign origin and not compare them verbatim to our modern computer-graphic FX-loaded violent features of American TV fame. Back in the mid fifties, Japan was still recovering from the ravages of a horrible war that had devastated all of their major cities. Under US occupation, Japanese elders felt threatened of loosing their ancestral identities and traditions. The recent and too-close-for-comfort Korean War had barely missed Japan and ended in a stalemate at a time when fear of another nuclear holocaust was very fresh and real in their minds. Shortly after, Japanese "baby boomers" (yes, Japan had their very own boomers too!) rejected their parent's post-war humiliation and needed to believe in something along Japanese customs, fairy tales, and mythology... so Sūpā Jaiantsu or Supergiant was born. Several Supergiant movies feature Starman protecting or defending children from dangers especially from space (i.e. threats for "above"). According to some natives, this theme had roots in the memory and horror of WWII's firebombing campaign over Japan. I saw these movies in their dubbed and chopped version back in 1964 in Grammar School on our monthly "Midnight Theater" actually shown at 0600 PM midweek. We (kids) were very impressed if not "terrified" by the space creatures but we were all happy that Starman did save the day and the movie ended "like a fairy tale". Forty years later, I was actually touched to relive these same scenes that had fascinated me so much as a kid and impressed me for years to come. I recommended these if you are interested in foreign cinema history or as relatively "clean" thrillers for our younger generation. Review by nowlang from the Internet Movie Database.